North Carolina's political maps are in flux. Here's better coverage. So it's a 31-day sprint – new legislative maps for North Carolina are supposed to be enacted by one month from today. The 28 racially gerrymandered districts need to be fixed quickly, but you'd be hard pressed to know which ones they are from the news. 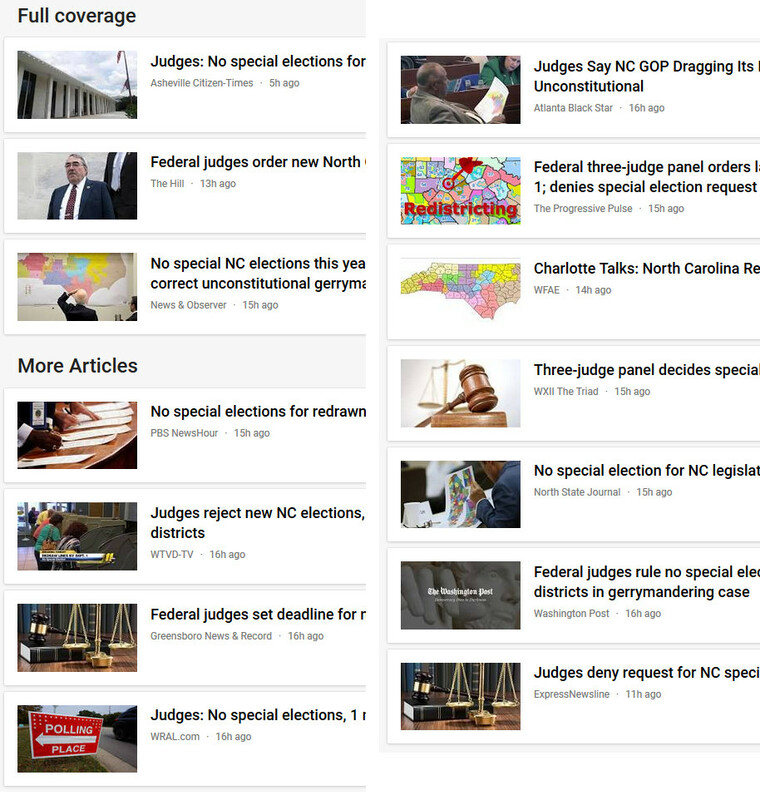 OK, maybe the General Assembly doesn't have to rush too much if the "worst kept secret" is true and the majority's preferred districts have already been drawn. And also, the court order does provide an option for a 14-day extension. But seasoned observers don't expect the NCGA to take the steps necessary to earn that extension. Mostly the familiar images of buildings, politicians, scales, gavels, and voting booths. Both the News and Observer and WFAE show the Congressional maps. Other images show partial or distant images of a map, but not in a way that's legible or informative. Last month, Districks (this blog) posted simple interactive maps of the overturned districts in both the House and Senate. Still, as I've noted elsewhere, to really grasp which districts will be redrawn, you need to understand about the county grouping requirements. I'm working on a post about that, hopefully to be posted later today.